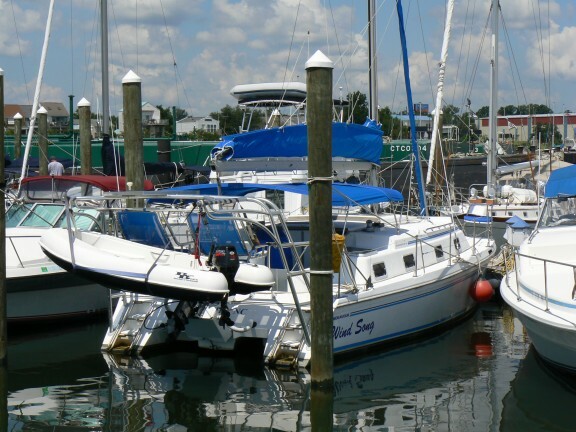 Wind Song is a 1992 EndeavourCat 30 (30 foot) catamaran with a 14 1/2 foot beam (width). She has a full-batten, deep-roach main sail stored in a Dutchman bag, a 110% jib sail, and a drifter head sail on a 6 foot bow sprit. She draws 3 1/2 feet. Even outfitted as a comfortable live-aboard, using the drifter sail, she often does over 50% wind speed on a Reach (point of sail). She has two staterooms with queen size berths and full head-room in the dressing area of each stateroom. Each stateroom has two portlights (windows) and a full overhead hatch with screen and privacy shade. There is one head (bathroom) including a separate full shower with a seat. The fresh water tank holds 75 gallons. There is a dining area below (salon) and the cockpit has a collapsible table. 12 Volt comfort fans are in each stateroom as well as the salon/galley area and the head. She's equipped with a 36 horsepower Yanmar Diesel outboard, a 6 KW Northern Lights diesel Genset (generator set), and a fuel polishing system. She holds 75 gallons of fuel. The electronics on board include auto pilot, wind, speed, and depth instruments, GPS inside and at the helm, VHF inside and at the helm, Heart Link 2000 battery monitor, Heart Freedom 25 battery charger/inverter, a 120 Watt solar charging system, and more. Wind Song has a complete galley (kitchen) including a microwave. There is even a portable ice maker available. Also, on board are reverse-cycle Air Conditioning (similar to a Heat Pump), Follow-Me Satellite TV, Bose Stereo Sound System, VCR, DVD, CD, cassette tape player, audio speakers above and below, propane BBQ, on-demand hot water, 6 gal. per hr. SK Watermaker, BossBoat fiberglass dinghy with 15 hp 4-stroke engine, inflatable kayaks, and more. Snuba for up to 4 divers is also available. There is a hot/cold cockpit shower at the port swim ladder and an anchor wash-down at the bow. There are connections for shore power and also shore water to bypass the on-board fresh water pump. In addition to the ones inside, there are also 12 Volt outlets in the cockpit and at the bow to provide floodlights for night navigation. Relaxing on Wind Song is easy. The arch has two lounge seats with padded headrests. There are also reclining seats (Sport-a-Seat) as well as hammocks. A hammock chair can even be used while under sail. On the bow, there are two padded pulpit seats. Check out the "More Photos" link below. 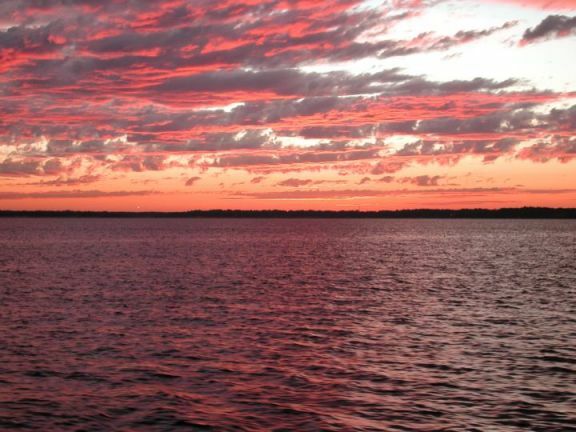 "Red sky at night - sailor's delight." The small light in the distant center is the Pensacola Lighthouse. This photo was taken without any filters and is un-retouched. Other than reducing the size, it has not been edited at all. Tony & Susan ride out Hurricane Ivan aboard Wind Song in Pensacola, Florida.